The Medicine Buddha mantra is recited for success. Since we have many problems and want to succeed we need to recite the Medicine Buddha mantra every day. It can help us eliminate the problems, unhappiness and suffering we don’t want and gain the success, happiness, inner growth and realizations of the path that we do. not only for healing but also to benefit people and animals all the time, whether they’re living or dying. If you recite the Medicine Buddha mantra every day you will purify your negative karma and this will help you never to be reborn in the lower realms. If you don’t purify your negative karma, then when you die you will be reborn in the lower realms as a hell being, hungry ghost or animal and will have to suffer again and again without end. Therefore you need to purify your negative karma right now. If you cannot bear even the present suffering of the human realm – which is blissful joy compared to that of the lower realms – how will you be able to bear the intense suffering of the lower realms, which is unimaginably unbearable, lasts for an incredible length of time and a billion times worse than all the human sufferings put together? Since reciting the Medicine Buddha mantra saves you from all these sufferings it is much more precious than skies of gold, diamonds, wish-fulfilling jewels and zillions and zillions of dollars. Material wealth counts for nothing because it can’t purify negative karma. Even if you possessed that much wealth, simply reciting or even hearing the Medicine Buddha mantra just once would be far more precious because it would leave an imprint of the entire path to enlightenment on your mind, help you gain realizations of the path, eradicate all your gross and subtle defilements and cause you to achieve enlightenment. The Medicine Buddha mantra can help you liberate numberless sentient beings from the vast oceans of suffering and bring them to enlightenment, so you should recite it with absolute trust in the Medicine Buddha, knowing that he will completely take care of your life and heal you in every way and that he is always with you – in your heart, on your crown and right there in front of you. There is not one second that the Medicine Buddha does not see or have compassion for you. Excerpted from “Advice for Daily Practice.” See also Teachings at the Medicine Buddha Retreat by Kyabje Lama Zopa Rinpoche. FPMT Educations Services has recently published Medicine Buddha Wish Granting Sovereign (the most extensive Medicine Buddha rite), composed by the Fifth Dalai Lama and translated by John Newman. Belly: I don’t want sentient beings suffering in samsara; thank you, you are so kind, taking time to understand me, that’s all. REJOICE everyone! 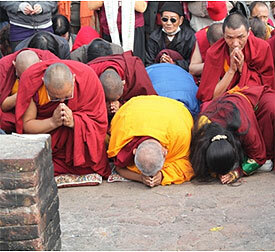 On behalf of all FPMT centers and students, an offering was made at the Long Life Puja for His Holiness during recent teachings in Bodhgaya, India. Given the importance of supplicating His Holiness to live long, all FPMT centers are advised to make an annual donation to that puja fund, and many remember to do that without any prompting! Many students and friends of the FPMT community reported that they had responded quickly to Rinpoche’s suggestions for the prayers and practices to be done for the victims of Haiti’s devastating earthquake. Rinpoche had advised reciting the five powerful mantras (especially, the Mitrugpa mantra) and the Sanghatasutra, as well as performing the Medicine Buddha puja. Those suggestions are additional to Rinpoche’s existing advice on how the centers and students can benefit those who suffer in the aftermath of natural disasters. Discovering Buddhism: Thanks to all who sent in their DB course and retreat dates! Please keep these dates coming when new DB courses/retreats are scheduled at your center! As always, you can share Discovering Buddhist retreat and course schedules with anyone interested. Living in the Path Online: The first module of Living in the Path Online, Motivation for Life, will be going live on the Online Learning Center in early February. Like DB Online, these modules (based on Rinpoche’s Light of the Path teachings in North Carolina, USA) will all be available for free to Friends of FPMT at the Dharma Supporter level or for a minimal cost through the Foundation Store. 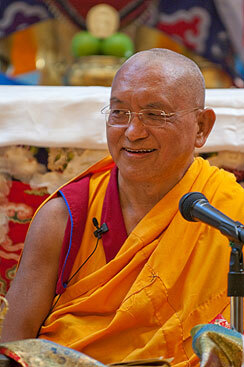 Lama Zopa Rinpoche has been emphasizing the benefits of the Namgyälma mantra for a long time. Recently, after reviewing the Education Services Namgyälma Card, Rinpoche made some changes to the design and asked that benefits and uses of the mantra be added, as well as phonetics. Rinpoche felt that leaving the back of the card blank was a waste of space! Thus an updated Namgyälma Card incorporating the advice is now available. NEW! 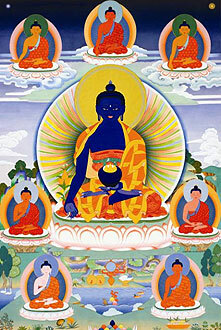 Medicine Buddha Wish Granting Sovereign, composed by the Fifth Dalai Lama, is the most extensive Medicine Buddha rite. It was requested by Lama Zopa Rinpoche and translated by John Newman. 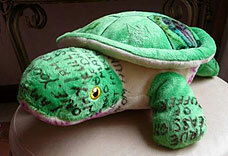 I think we can guess what Medicine Buddha puja Rinpoche will be requesting now! Coming Soon! The FPMT Retreat Prayer Book will be available from the Foundation Store February 15. Keep an eye on the New Arrivals page. This prayer book will be used at the Light of the Path retreat (if you received one in 2009, there is no need to purchase the new edition) and this English version will be available only through the Foundation Store (and not at the LOP retreat itself). The fabulous Discovering Buddhism two-disc DVD series will be available in March with subtitles in English, French, German and Spanish. Please consider purchasing these in bulk for distribution or printing locally. These DVDs continue to be highly praised by all who watch them! Ven. Thubten Labdron, director of Root Institute for Wisdom Culture sends this report:We were exceptionally fortunate this winter in having the opportunity to host Kyabje Lama Zopa Rinpoche’s private retreat, between the November Kopan course and His Holiness the Dalai Lama’s January teachings in Bodhgaya. large group of guests and gave an impromptu talk on the benefits of prayer wheels, before disappearing into retreat. For once, we were extremely happy not to see Rinpoche around, just to rejoice that Rinpoche was in retreat. Just as the retreat was finishing, Khadro-la and Dagri Rinpoche arrived – and then the activities really started. January 5 – The first day of His Holiness Dalai Lama’s teachings was attended by tens of thousands of Tibetans and foreigners and a veritable gathering of lamas, including Gyalwa Karmapa and the newly enthroned Khensur Rinpoche Jangtse Choje, Lobsang Tenzin (who had just led a Tara retreat at Root). January 6 – The Tibetans for a Vegetarian Society organized a candlelight procession from the Mahabodhi (Sri Lanka) Society to the Mahabodhi Stupa, led by Lama Zopa Rinpoche with Richard Gere. Rinpoche gave a short talk inside the stupa gardens and led hundreds of Tibetans and non-Tibetans around the outer korwa, chanting and brandishing lights, amidst hundreds of other circumambulating devotees. It was joyous pandemonium, especially when the last session of the Gelugpa Monlam finished and hundreds of monks poured onto the korwa; with a large group of media persons with cameras running backwards at the head of the procession and others trying to mob Richard Gere. A great success for vegetarianism! January 7 and 8 – It was a blur of activity, with an emphasis on bird liberation. Richard Gere and Charok Lama arriving back each lunch time with Rinpoche and several cages of birds, a quick sprint of several laps around the Maitreya statue and stupas, then up to Rinpoche’s room for blessings from the relics and mantras, then back to the tent for the afternoon session … and more birds. January 9 – The teachings finished at lunch time with a special group interview for Westerners with His Holiness. That too ended in chaos when there was a rush to get photographed with His Holiness, who was smiling and unruffled while the security men quickly put an end to the event. 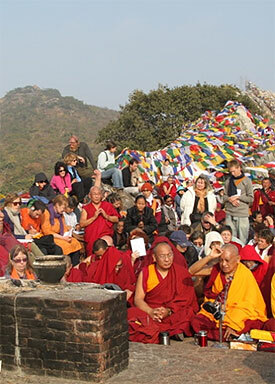 During the teachings, Tenzin Pasang, the newly confirmed incarnation of Ribur Rinpoche arrived in Bodhgaya. Lama Zopa Rinpoche offered an enthronement ceremony in the Root Institute gompa with Kopan Khen Rinpoche, senior Kopan monks, and students. Ribur Rinpoche’s father and sister, his attendant, Ven. Tenchok Tenzin, and Oser Rinpoche were all present, as were Richard Gere and Fabrizio Palloti, both of whom had been very close to Ribur Rinpoche. It was a very joyful occasion. January 10 – A Sangha lunch at Root Institute garden was sponsored by the International Mahayana Institute, with our “resident” lamas and dakini, Geshe Tashi Tsering (previous teacher of Chenrezig Institute and present Gyurme Lama Umze) and around 60 Sangha who included Ven. Ngawang Samten, Rinpoche’s sister from Lawudo. January 11 – We had an amazing pilgrimage to Vulture’s Peak, Rajgir, with all our lamas and friends, in a convoy of several jeeps and five buses. Khadro-la performed the bodhisattva vows ceremony on the Peak, and when Rinpoche and Dagri Rinpoche arrived they all chanted several praises to Buddha and dependent arising. Rinpoche gave an explanation of the wheel of life and the twelve links and then gave a concise teaching on emptiness and dependent arising. After the teaching, the lamas recited several more prayers composed by His Holiness the Dalai Lama, and Khadro-la chanted Ma Sam Jo Me … a prayer in relation to Perfection of Wisdom. It was a minor miracle was that somehow we all managed to fit on Vulture’s Peak. January 12 – A combined talk was given by Dagri Rinpoche and Khadro-la in our gompa, followed in the evening by the consecration puja of the large wealth mandala, made from colored threads, at Maitreya Project. January 13 – Rinpoche left for Varanasi and missed the flight out of India, but flew the next day to Taiwan. What a wonderful time! It felt like a whole year happened in that one month. The magical chanting led by Lama Zopa Rinpoche, Dagri Rinpoche and Khadro-la is available for download in MP3 format. “We usually don’t give feedback forms but we get some idea on the happiness of the participants from the number of people leaving early, and also from the number of people staying on for the seven-day retreat, and coming back for other courses. “This year [out of the record 240 attending], about 10 people left, mostly because they didn’t feel it was what they wanted. Some people leave because it gets too much for them, and there were about four or five of them. So I feel this past course went very well – in general, people were very happy, and they sent us emails on how wonderful their time here was and how beneficial. “Around 80 people stayed on for the seven-day retreat. All of the 16 people for the Vajrasattva retreat starting on December 25 have done a November course, this year or last year. Around 50% of the people coming for the vipassana course starting January 30 are from the November course in 2009. Congratulations! Pamtingpa Study Group (Washington, USA) becomes Pamtingpa Center!